Editor’s note: this report has been updated since its original publication with new information. MSNBC viewers who tuned in at 2 p.m. Monday afternoon expecting to see Thomas Roberts were bitterly disappointed. On Sunday, the out anchor confirmed to his tens of thousands of followers, fans and friends via Facebook that the network canceled his afternoon news program on Friday, but left unanswered the question of what happens to him next. 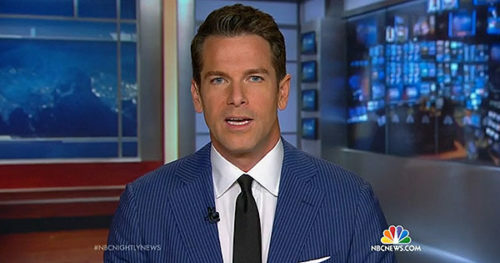 “MSNBC Live with Thomas Roberts” debuted in March 2015, replacing the ratings-challenged Ronan Farrow show, and marked only the second program to be anchored by an LGBTQ journalist. Originally a two-hour newscast, MSNBC slashed it in half to one hour earlier this year, along with all its other shows, according to a source close to the program. No reason was given for dropping Roberts’ show and no official announcement was made. The gossip rag Page Six broke the news. The source, who spoke on background, told LGBTQNation Thomas Roberts was scoring competitive ratings compared to other daytime shows on MSNBC, and was not by any measure its lowest-rated program. The source described the cancellation as “quite confusing,” given Roberts and his team won an Emmy for Breaking News in September for its coverage of the June 2015 Supreme Court decision on marriage equality. That was quite a personal victory for Roberts, who married his partner in October 2012. Although Roberts has anchored from time to time on MSNBC and filled-in as anchor of “NBC Nightly News,” the show bearing his name was the second effort by Roberts that the network has canned. MSNBC shelved his “Shift” online program “Out There” shortly after launching the afternoon show. Aside from Roberts and Rachel Maddow the only other out anchor on MSNBC has been Steve Kornacki, who was hired in 2013.